I have a new artist’s model. Meet Freyja, a darling little creature hardly more than 5 weeks old. Somebody found her wandering on her own on a farm and took her to the vet. Hannah-Jo​, veterinary nurse extrordinare, and auntie as it happens, to Arthur and Percy, took her in and looked after her. Hannah called her Mud, because that’s what she mostly was when she came in. She needed a home, and so she came home with me, and now she is called Freyja. Arthur and Percy would like it stated that they were not consulted on the matter, neither in the naming, nor indeed in the adopting of such a creature in the first place, and there has been some grumbling, but I think they will come round, after all, who wouldn’t? 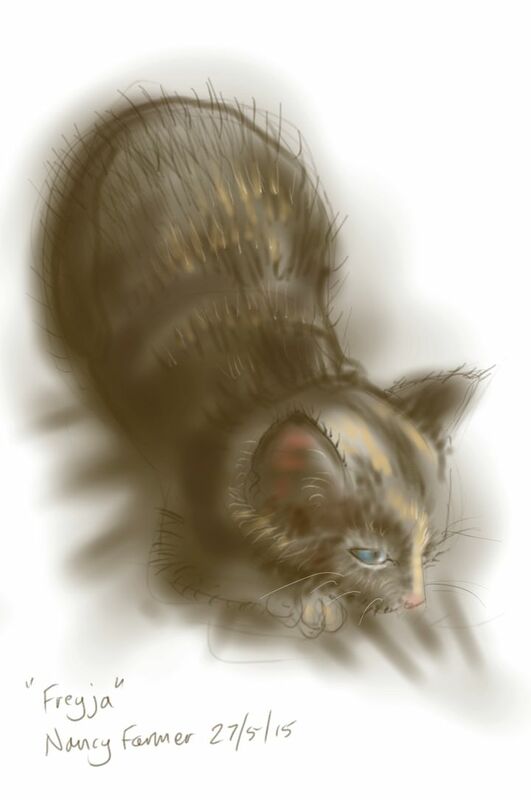 This entry was posted in Cats and tagged art, cat drawing, cat-of-the-day, drawing, Freyja Kitten, kitten, sketch, tablet sketch, tortoiseshell on May 27, 2015 by Nancy Farmer. 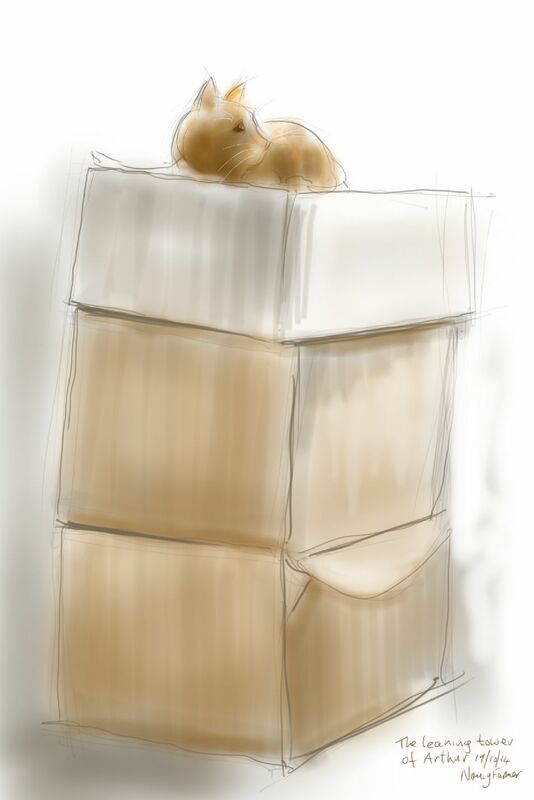 This entry was posted in Nudes, swimming and tagged art, chillswim tow float, cold water swimming, drawing, getting dressed, illustration, nudes dressing, open water swimming, sketch, swimming, tablet sketch, tow float on March 11, 2015 by Nancy Farmer. 18 minutes round the lake; our first swim of spring. We’ve made it: we swam all through the winter. 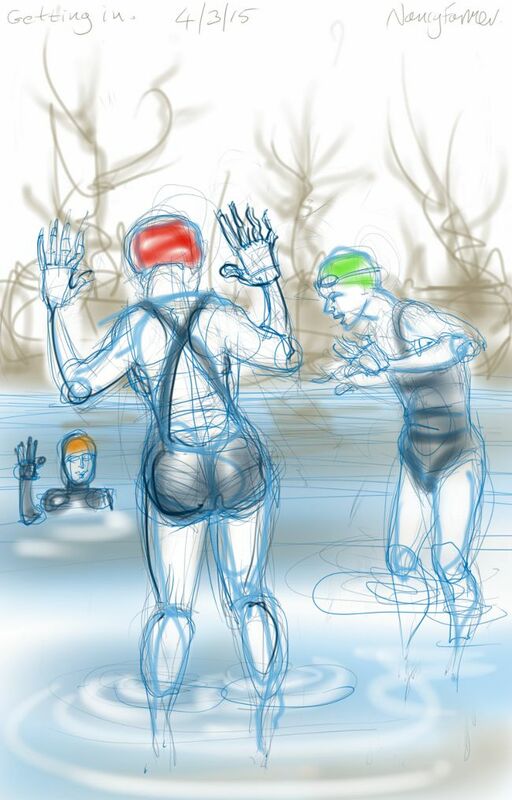 This entry was posted in swimming and tagged art, cold water swimming, digital sketch, drawing, illustration, somerset, tablet sketch, Vobster Quay, wild swimming on March 4, 2015 by Nancy Farmer. This is the recovery position for winter swimmers, not for drunk people. Though addled brains, an inability to speak in long sentences and a tendency to throw your drink all over the place are common to both conditions. You probably haven’t known shivering until you have known winter swimming, And still I persist in finding it strangely amusing. 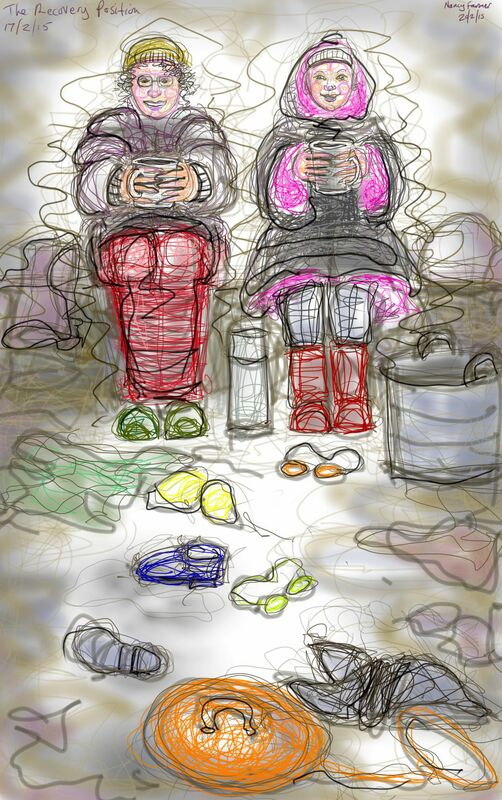 This entry was posted in People, swimming and tagged art, chillswim tow float, cold water swimming, drawing, illustration, open water swimming, swimming, tablet sketch, tow float, Vobster Quay, winter swimming on February 21, 2015 by Nancy Farmer. Green hair and skull cherries! Kez, again, in the pub, again. I will admit that this doesn’t look as much like Kez as a couple of other ones I drew of her; I was trying to catch a momentary expression, rather than a ‘Kez-sitting-still-because-I-am-drawing-her’ kind of pose, and it’s much harder to get that accurate enough for a close likeness. 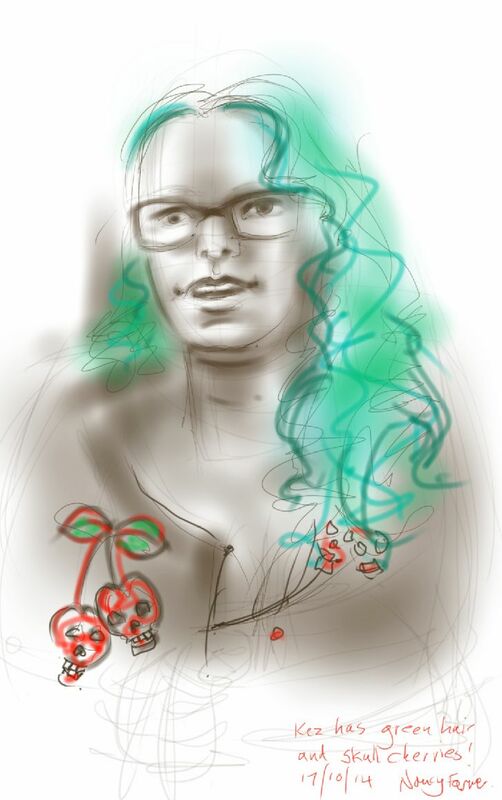 The hair is fairly accurate however, and she did have skulls on her cardi in the shape of bunches of cherries! 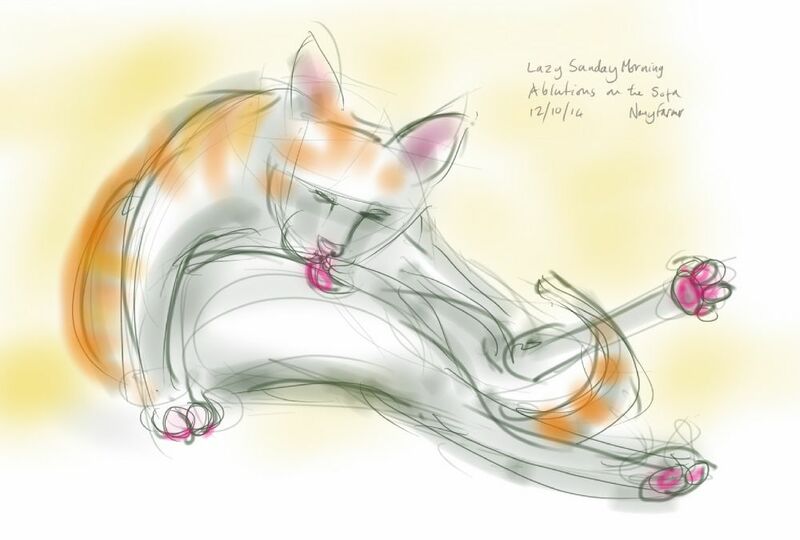 This entry was posted in People, Portraits and tagged art, digital sketch, drawing, green hair, illustration, life drawing, people, portrait, sketch, tablet sketch on October 18, 2014 by Nancy Farmer.